How long gas flow velocities will minimize the risk of "spitting"
Coal fired power station in Poland modifies existing chimney for FGD wet stack operation by installing a PennguardTM borosilicate glass block lining onto concrete windshield. 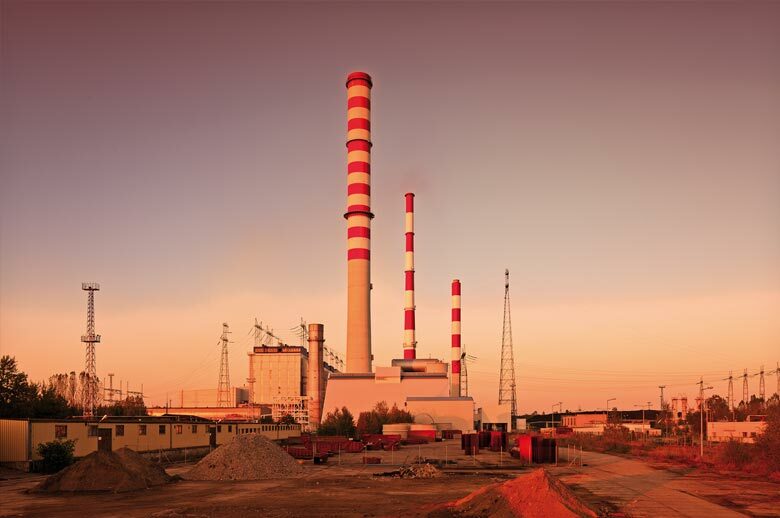 Close to the city of Szczecin in northern Poland, the largest power company in the country, PGE, owns and operates the 1,772 MW coal fired Dolna Odra Power Station. 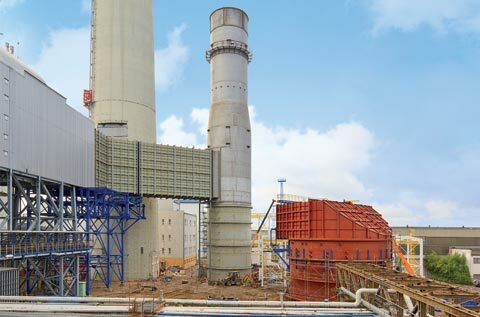 The power station has eight boilers and its Units 5 through 8, with a combined capacity of 908 MW, discharge their flue gases into a single, 200 m high concrete chimney. 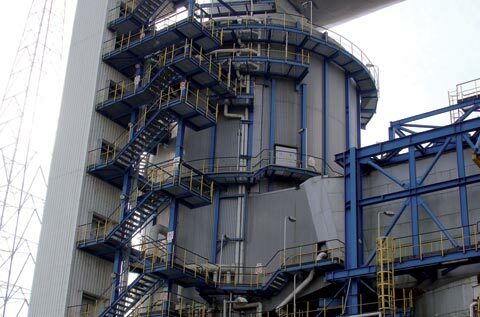 Since the year 2002, the power station has been equipped with one wet limestone FGD system, known as the Unit 7 & 8 FGD. The Unit 7 & 8 FGD includes a gas-to-gas-reheater(“GGH”). The flue gas stream in the 200 m chimney is a mix of desulfurized, reheated flue gas from Units 7 & 8 and untreated, hot flue gas from Units 5 & 6. Based on these relatively dry operating conditions, the chimney was constructed with a sectional brick flue using interlocking, acid resistant brick. Since then, PGE Dolna Odra have ordered Polish contractor Rafako to design and construct a further wet limestone FGD system, for Units 5 & 6. The Unit 5 & 6 FGD will be commissioned in 2012. Around the same time, the Unit 7 & 8 FGD will be modernized and its GGH reheat will be eliminated. 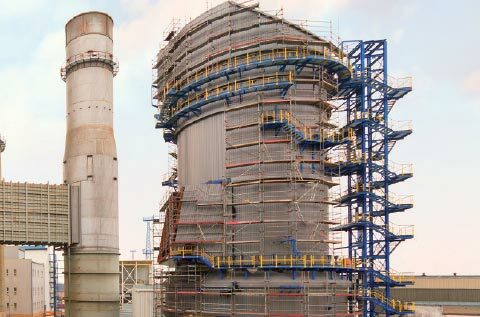 With the Unit 5 & 6 and Unit 7 & 8 FGD’s operational, the combined flue gas stream from Units 5 through 8 will be desulfurized and, in the absence of reheat for either FGD system, the 200 m chimney will operate as a wet stack, carrying water saturated flue gas. To prepare the chimney for these future operating conditions, the contractor has removed the brick flue and its supports, and then installed a 54 mm thick PennguardTM borosilicate glass block lining onto the internal, 7,575 m² surface of the concrete windshield. Built in 2002, the Unit 5-8 chimney originally contained a sectional flue of interlocking, acid resistant brick. The brick flue had a diameter of 8,7 metres and it was externally insulated with 50mm thick thermal insulation. The Unit 7 & 8 FGD system is connected to the common flue gas duct that runs between units 5 through 8 and the chimney. This FGD system has a rotary gas-to-gas-reheater (GGH) which increases the temperature of the desulfurized gas to about 80°C. The Unit 5 & 6 FGD system will also be connected to the common Unit 5-8 flue gas duct. It will not be equipped with any reheat. The Unit 5 & 6 FGD will be commissioned in 2012. Around that time, the Unit 7 & 8 FGD will be modernized and its GGH will be removed. 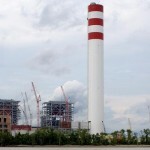 The Unit 5-8 chimney will then become a wet stack. The 8.7 metre diameter of the brick flue would result in a wet stack gas flow velocity of well over 23 m/s. Such a flow velocity would likely result in excessive carryover of liquid droplets from the top of the chimney. To make the chimney suitable for safe wet stack operation, the owner decided to “open up” the chimney by removing the brick and installing a PennguardTM borosilicate glass block lining system directly onto the concrete windshield. This design change results in a chimney top diameter of 12.6 metres and a very safe, gas flow velocity of 11-12 m/s. EPC contractor Rafako selected Uniserv SA as the contractor for the design and execution of the chimney modification works. 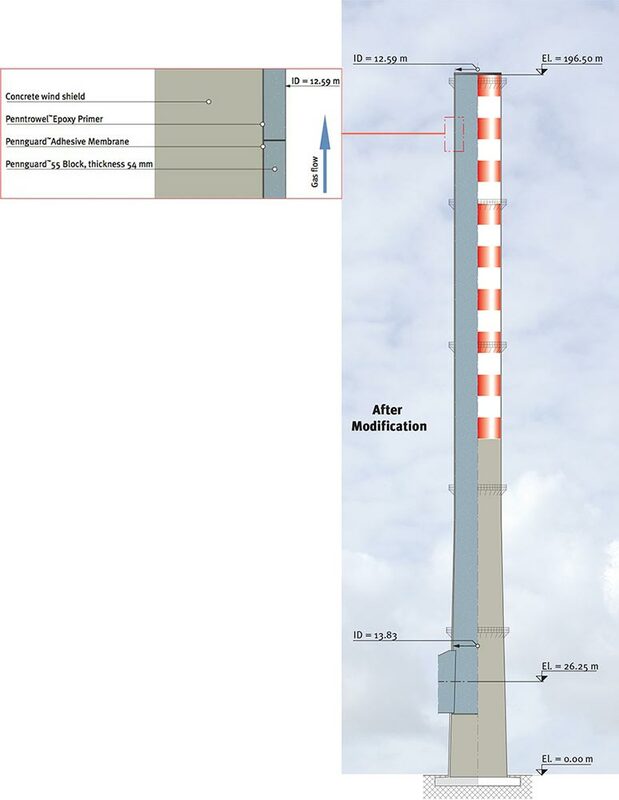 Uniserv’s scope of work included the construction and demolition of a 60 m high temporary stack. Following completion of the temporary stack, the contractor removed the brick flue and its concrete supports. 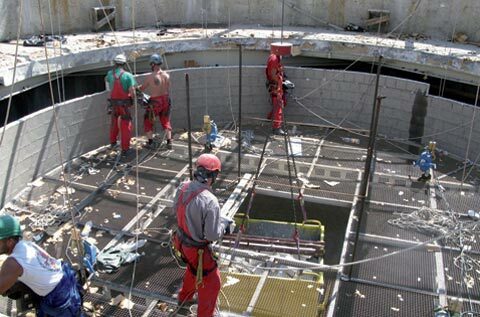 Platforms for monitoring equipment and maintenance were installed on the outside of the concrete shell. 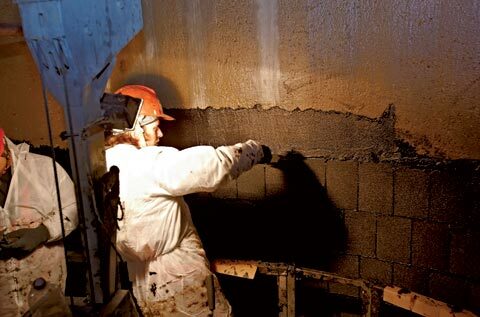 Following grit blasting of the concrete surface, spot repairs and application of PenntrowelTM Epoxy Primer, the 54 mm PennguardTM lining was installed onto a surface area of 7,575 m² by teams of up to 18 brick layers in a total of 72 shifts. All of this installation work was performed under supervision of Hadek Quality Assurance Inspectors. The operation of FGD “wet stacks”, without any reheat of the desulfurized flue gas stream, can be very economical. 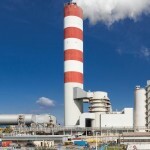 At the same time however, it creates a risk of “spitting”; droplets of acid condensate will be blown out of the top of the stack and create a nuisance problem for the power station and the surrounding area. One of the most important design parameters that will determine the risk of spitting is the gas flow velocity within the chimney. Once this velocity exceeds a critical limit, the liquid film on the chimney wall will be entrained into the gas stream as droplets. Maximum stack liner gas velocities for 4 materials. Source: Alden Research Laboratory Inc. 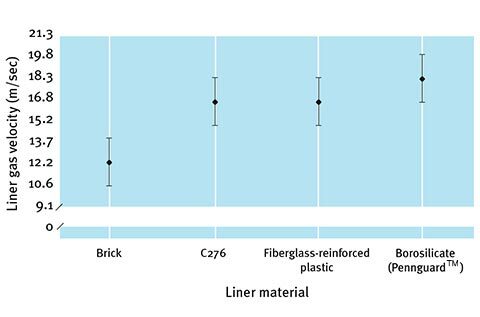 Figure 1 shows the maximum flue gas velocities for different chimney wall materials, as recommended by specialist consultants Alden Research Laboratory from the United States. The approach chosen for the Dolna Odra Unit 5 – 8 chimney can be considered especially safe. 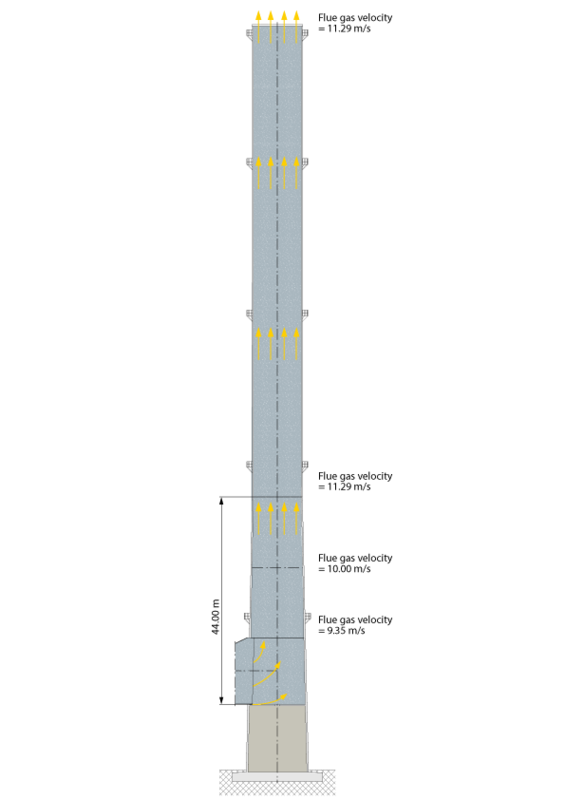 After the removal of the brick flue and the application of the PennguardTM lining onto the concrete windshield, the effective diameter of the chimney varies from 13.8 m at the flue gas entry level to 12.6 m at the top. 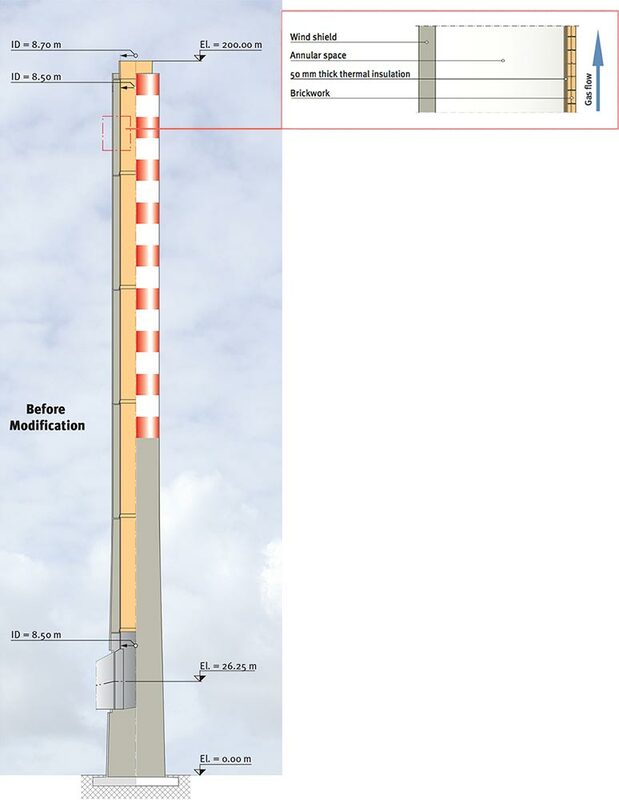 In the lower 44 metres of the chimney, the maximum gas flow velocity for wet stack operation will be between 9.35 and 11.3 m/s. 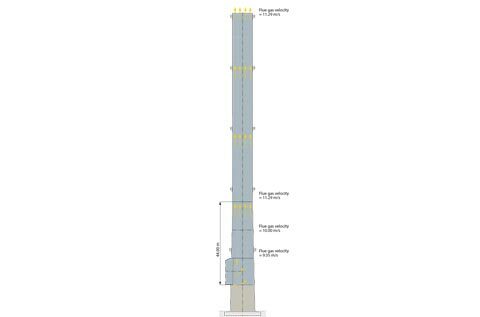 In the upper, cylindrical part of the chimney, the maximum gas flow velocity for wet stack operation will be at around 12 m/s, which represents a safety margin of over 30 % below Alden’s recommended design velocity limit of 18.3 m/s (60 f/s).